When I’m invited to a Shabbat or holiday meal in a Jewish home, I always bring kosher wine. Not just that, I try to make it Israeli. It’s not because I keep kosher. And it’s not because the people I’m visiting necessarily keep kosher either. So if wine by any other name smells as sweet, why bother? I know I’m not alone – plenty of Jews who ordinarily ignore the laws of kashrut buy kosher wine for Shabbat, stock their pantries with kosher-for-Passover food every spring, and pay extra for kosher catering at their simchas. First PersonHypocritical? Yes, if you believe that procuring and ingesting kosher food has merit only within the context of a fully observant lifestyle. But that construct holds sway today mainly at the far ends of the observance spectrum, among those fervent Orthodox who don’t tolerate any deviation from kashrut and the few remaining “Classical Reform” Jews who are hostile to Jewish rituals in general, including kashrut. Increasing numbers of American Jews, however, do not consider the kosher diet a divine commandment but an expression of Jewish identity, a mark of membership in the tribe. As such, it is a moving target. Putting kosher food on the table does not signal one’s denominational affiliation or level of observance so much as the strength of one’s connection to Jewish history, Jewish community, and even the land of Israel. It’s a different, very modern, and specifically Western way of looking at Jewish dietary practice. Let’s look at the numbers. According to the Mintel International Group, a market research firm that releases periodic reports on the kosher industry, more than 40 percent of the food sold in American supermarkets is kosher-certified. The group’s January 2009 report claimed that $195 billion of the previous year’s $400 billion in food sales came from kosher products, an astounding figure given that Jews make up less than 3 percent of the population and most don’t even keep kosher. Sure, most of that kosher-certified food represents mainstream products such as Heinz ketchup and Tropicana orange juice that consumers buy without regard to its kosher status. More telling is the same report’s figure of $12.5 billion in sales within the dedicated kosher market, meaning products bought because of the kosher label. Many are non-Jews who believe that kosher food, especially kosher meat and poultry, is safer, healthier, and of higher quality than its non-kosher counterpart. Others are non-Jews whose moral or religious beliefs are satisfied by kosher certification: Muslims who buy kosher meat when halal is unavailable and vegetarians who seek a “D” symbol indicating a meatless product fall into this category. They might be lactose-intolerant, assured by a pareve label that a product contains no dairy; the reasons are myriad. 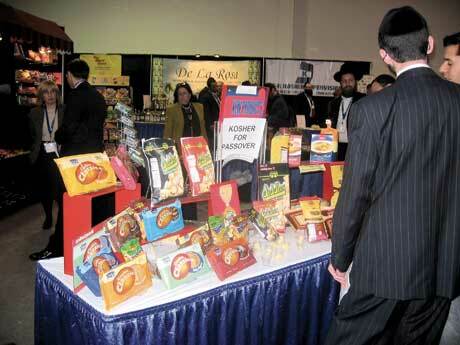 But many of the people who buy kosher food on purpose are Jewish but nonobservant. Some of them buy kosher products for the same reason as non-Jews; they believe it’s safer or of higher quality. Many more, however, do it for reasons of community, tradition, and Jewish identity. This is particularly true on the Jewish holidays, which have become times for nonobservant Jews to connect with their history by setting Jewish food on the table. Many Jews who don’t keep kosher the rest of the year buy kosher wine and matzoh for Passover, sometimes out of respect for parents or grandparents, sometimes because it makes them feel more Jewish, and sometimes because of an inchoate feeling that it would be wrong to do otherwise. For its January 2009 report, Mintel surveyed 2,500 adults about their food-buying habits. Thirteen percent, or 335 respondents, said they regularly buy kosher food. Of the 86 percent who said they were not observant Jews, 25 percent said they buy kosher food out of respect for their own or their partner’s family traditions. Researchers interpreted that to mean they are Jewish, simply not kashrut-observant. And more than half said they buy kosher products “occasionally,” which the researchers chalked up to Passover, Rosh HaShanah, and impending visits by the in-laws. Food manufacturers are well aware of this holiday shopping phenomenon. Manufacturers of so-called traditional kosher foods such as matzoh and gefilte fish typically do 40 percent of their business strictly at Passover. Spokesmen for the Manischewitz Company put that figure at 50 percent. When I was researching my book about kashrut and the kosher food industry, “Kosher Nation: Why More and More of America’s Food Answers to a Higher Authority,” I spoke to many self-described nonobservant or partially observant Jews who bring out the kosher food on sacred occasions. One woman in Glenview, Ill., told me that she keeps a kosher-style home, meaning she does not bring in pork or shellfish, but she will buy packaged food products without kosher symbols. She keeps “kosher by ingredient,” reading the labels to make sure a product contains no lard or other clearly non-kosher ingredients. But when her children were growing up, she said, she made the family home kosher for Passover every spring. They’d put all the bread, pasta, cereals, and other non-Passover foods in a pantry, which she would lock for the duration of the holiday. The kids would draw skulls and crossbones on the door to indicate it was off-limits for the next eight days. She also bought kosher-for-Passover food items, even though those same foods without kosher symbols were good enough the rest of the year. So why do I seek out kosher Israeli wine for Shabbat and Jewish holidays? Probably because I miss Israel, where I lived for many years as a kibbutz volunteer and newspaper reporter. Marxist philosopher Walter Benjamin explains this as the (illusory) power of the artifact to collapse the distance between producer and consumer. When I hold a bottle of Yarden Cabernet, I feel a physical connection to the soil, the grapes, and the workers who produced it. And when I pour it into my cup and make the kiddush, I feel connected to the generations of Jews who have broken bread together over the years and are doing so today no matter where they live. Illusory? Not to the soul. Names do matter, no matter how sweet the drink.